Michael Pybus’ works spawn from a cloud of their own meta manifestation. Images, characters, brands and franchises are irreverently spliced and reborn as iconoclastic memes questioning how we interpret and project values onto cultural and consumer paraphernalia. He dissects and remixes a plethora of iconography to create works which investigate and at times humorously poke at what we accept as the real, the authentic, the original. From his identity as an artist - the cliched ‘original’ - to the hierarchies and identities we apply through our choices in likes, opinions, consumer goods and aesthetics he explores the underlying scaffolding that supports how as a society and culture we come to view, value and contextualise the wealth of competing information, ideas and options we are subjected to every day. Sampling liberally from our global networked collective consciousness here mixes our over stimulated environment to create new narratives and readings to the images that surround our consumer and cultural consciousness. 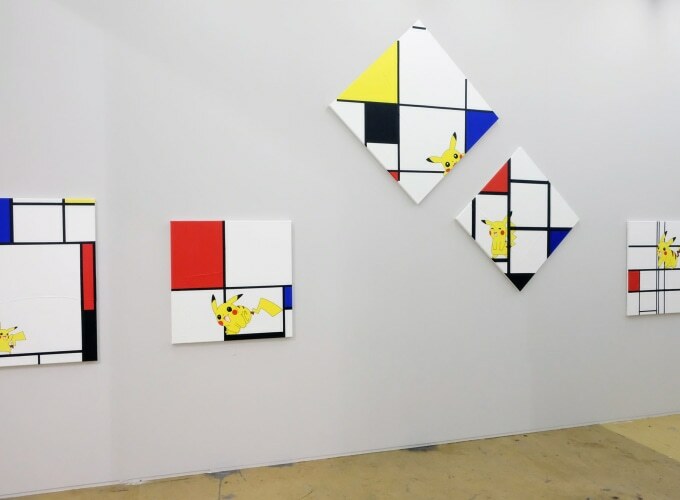 For Art Rotterdam Michael Pybus presents a new series of paintings paying homage to one of the Netherlands most iconic artists, Piet Mondrian. 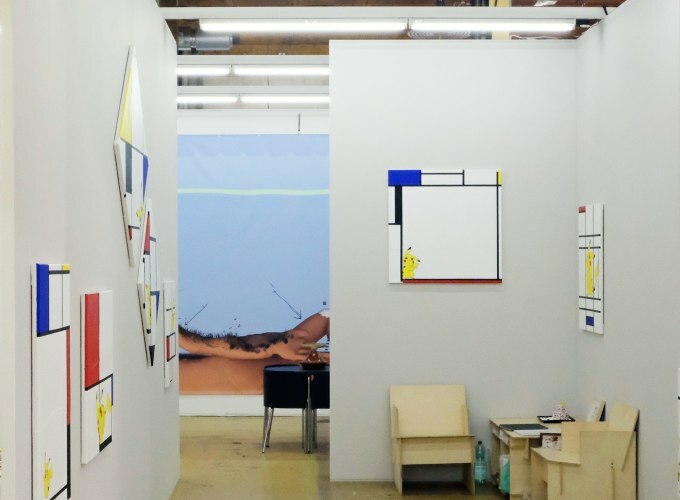 Each of Pybus’ paintings are sampled from Mondrian’s historical canon, to which he has freely reconfigured and augmented to his own personal compositional choices, much like one may add digital stickers and gifs to images in apps like Snapchat and Instagram. Pybus mirrors these virtual gestures and translates them to the analogue, through the physical process of painting to create hybridised works that merge one of art histories biggest stars with the most successful entertainment franchise of all time Pokémon. Disrupting the famed primarily yellow planes from Mondrian’s iconic pieces with the Nintendo’s lead character Pikachu. The Mondrian paintings, by now global icons of success and wealth are emulated by Pybus and through his ‘remaking’ of them he reflects upon our collective tendency to emulate those who are perceived as superior in their social, professional and economic status. The works channel a 'Kardashian phenomenon' which embodies our escape into virtual expression and ‘reality culture' at a point in our history where our insatiable appetite to be distracted from our ‘actual realities’ cannot be curbed. Gotta Catch ‘Em All! / Gotta Collect ‘Em All!